This is my first year doing Golden Pints but from what I've been told it's really hard to actually sit down and do it. How hard can it possibly be? Best Australian Draught Beer - Buckley's Alchemy Lemongrass Pale Ale. I'm pulling one from left field here. Richo and I sampled this beer at the College Lawn Hotel's Beerfest and on reflection I think it wins my Draught beer of the year for being that little bit different and standing out from the pack. Best Australian Bottled or Canned Beer - Mountain Goat Cross Breed Gypsy and the Goat. Brewed in Melbourne in collaboration with Mikkeller, this Black Pepperberry IPA was delicious, if not hugely complex. It was one of the most drinkable examples of the style that I've ever managed to get my hands on. Best Overseas Bottled or Canned Beer - BridgePort IPA. I've been thinking about this one for days and finally I think I've settled on BridgePort IPA. I've been drinking it around a few bars in Melbourne recently and it's just such a lovely IPA. It's got fantastic drinkability which for me is definitely an important thing to consider in this category. This was definitely one of the hardest categories to pick. Best Overall Beer - BrewDog AB:04. 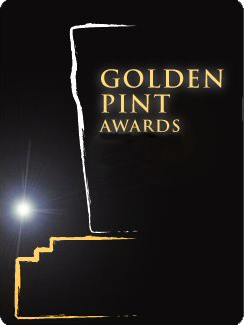 I decided my overall winner would not be one of the previous Golden Pint winners from above. I picked Abstrakt 04 because it was simply the best stout I've ever had let alone just this year. It's not a beer you could drink everyday but the drinking experience was second to none. Best Pumpclip or Label - The Mash Collective Amasia Rumweizen. This label from Stone & Wood's Mash Collective took home the my Golden Pint for the Best Label. I thought it was really cool and captured a bit of Byron Bay culture at the same time, whether it meant to or not. Best Australian Brewery - Red Duck. This was one of the hardest categories for me to choose. They pumped out 30 brews this year with plans for even more next year. The quality has really lifted in the past year and a bit and I'm looking forward to lots more new stuff next year! Best Overseas Brewery - Nøgne Ø. Again there were just so many to pick from but I've stuck with the Norwegians because I don't think I've had a beer from them that I don't love! Honorable mentions are due to Sierra Nevada, BrewDog and Emerson's of New Zealand. Pub/Bar of the Year - Beer Deluxe. I was tossing up between Deja Vu, Beer Deluxe and Josie Bones (although it's really more of a restaurant than a bar...). Beer Deluxe took the crown because I had a great night there a few weeks ago, but any of the three are great venues. Beer Deluxe may be a little pricey but you can never doubt the freshness of the beer which is always superb! Beer Festival of the Year - GABS. This was a non-contest for me. The Great Australasian Beer Spectapular was brilliant in every sense of the word. I met heaps of great beer people and would have had at least half of the 60 beers available on tap! Supermarket of the Year - Dan Murphy's. Although not really a supermarket Dan's is associated with Woolworth's and has a heap of locations. The micro beer range is really starting to pick up there's still just a few issues with the freshness and condition of the stock. Independent Retailer of the Year - Purvis Beer. The place where my love of international craft beer really grew from. The range is enormous with new stuff in almost every week. The staff are always friendly and happy to chat beer (and sometimes even open one to share). Friday night tastings are always a winner as well. If you're in Melbourne it's Beer Mecca! Online Retailer of the Year - The International Beer Shop. These guys are based in Perth and have an awesome range of beers. Delivery only takes a week and is pretty cheap. Out of all the places I've got beer online from they are by far the best. Best Beer Book or Magazine - Beer and Brewer. Well I may be somewhat biased as I did recently have an article published. I also really liked "The Oxford Companion to Beer" by Garrett Oliver from Brooklyn Brewery, it's a thoroughly useful resource. Best Beer Blog or Website - The Crafty Pint! 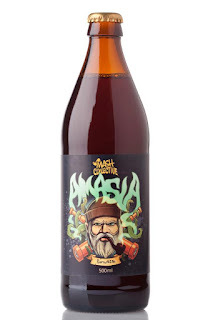 Hand's down Australia's best online craft beer website. It's regularly updated and the weekly newsletter (although not always on-time...) is a great way to get through the last few hours of work on a Friday. Best Beer Twitterer - I'm not hugely into Twitter, it's something I'm looking into further for next year, however from the little I do follow I'm going to have to go with NateDawg27. He tells it how he sees it and is well worth following. Food and Beer Pairing of the Year - I can't think of a specific time off the top of my head, although I know I had a number of IPA's this year with Pork Belly. That's probably my favourite food and beer pairing for the year as a concept, Josie Bones makes an amazing Pork Belly and has a great range of IPA's so that's a good place to start. They also do beer matching to your meal which is fun. In 2013 I’d most like to... - Get into homebrewing a little more. I've been involved with the odd experimental brew but none of my own. It's something that needs to be explored by me at somepoint and next year seems like as good a time as any. Well after mulling over some of these categories for days, I've come to the conclusion that this wasn't difficult... it was almost impossible! I've made some tough calls and I've got my Golden Pints up just in time for the end of the year. I hope everyone enjoys them as it was a really hard thing to do! Hopefully next year proves just as difficult with more excellent beers to try. I hope everyone has a safe New Years celebration and I look forward to sharing some more beer adventures in 2013! It is a movement that seeks to empower people to have an entrepreneurial mindset and strive for financial freedom. Greymentor is derived from Grey Matter and it’s all about using your brain to think outside of the box and Mentor being mentorship.We believe it is your turn to be on the BRW list or have a Fortune 500 business.